I am including Marbecks in my blog mainly for the fact that it is a chain of retailers in New Zealand. This family business has been established since 1934 and, in their time, have sold wax cylinders and 78s, a consignment of which was shipped from England and reportedly “was sold in a day”. 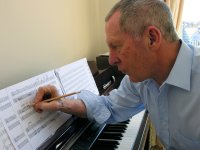 For many years Craven has exclusively focused his attention upon the development of the compositional and performance techniques associated with his Non-Prescriptive style of music which, in essence, seeks to realign the relationship between composer and performer. On the rare occasions that his music has been performed live, it has been received with great appreciation by the audiences and artists involved. There is now a growing interest from both amateur and professional musicians and in academia with regard to the distinctiveness of the concept of his Non-Prescriptive music, and the associated techniques which include elements of aleatorism, optional phrasing, improvisation and open interpretation. None of these are in themselves new but they are here presented in a particular fashion which is Eric Craven’s own. The three Sonatas are written with varying degree of Prescription (and converse freedom) and in very different structures from the 7th Sonata, a quasi-classical “arch” structure, to the massive monolithic 8th. They are of the highest order throughout and masterworks of collaboration between composer and performer. A sought-after interpreter of new music, Mary Dullea’s expansive repertoire covers the standard piano literature as well as an ever-increasing amount of 20th- and 21st- century compositions, many of which are dedicated to her. She has commissioned and premiered works from composers as varied as Michael Finnissy, Johannes Maria Staud, Michael Nyman, Donnacha Dennehy and Gerald Barry – notably with her piano trio, The Fidelio Trio and with violinist, Darragh Morgan. As well as the present album of Sonatas by Eric Craven, Mary recorded Craven’s suite ‘Set’ for piano for Metier and is becoming an enthusiastic advocate of his compositional technique. The reviewer, John France, also commences his piece by explaining my Non-Prescriptive techniques notably adding that my Middle-Order Non-Prescriptive techniques “confuse the issue” he does not explain why. He refers to and compares me favourably with the composer Kaikhosru Sorabji who was an English composer, music critic, pianist and writer. He was one of the twentieth century’s most prolific piano composers. I have listened to Sorabji and, short of us both exhibiting similar mild eccentricities, I cannot hear that our music has much in common. Would you, the reader, care to compare and comment on this point? Unlike Bruce Reader, Mr. France does not undertake to “tease out the progress of these three sonatas” which he kindly describes as being “full of interest” and considers them to be “timeless works”. Again, I am pleased to see that Mary is given lavish praise. This month’s issue of the magazine includes a quite substantial review of the Sonatas by Bruce Reader. His generous comments give deserved recognition to Scott’s “essential addition to this release” and, whether he is cognizant of this or not, acknowledgs the synergy that lies at the core of my Non-Prescriptive techniques, the necessary relationship which must be established between composer and performer”. Sonata No. 7…..”is an enormously interesting work full of fine moments played brilliantly by Mary Dullea realising Craven’s ideas to remarkable effect”. Sonata No. 8…….”the surges of melodic and fragmented staccato ideas ……. many intensely still quiet moments beautifully realised by this pianist”. Sonata No. 9…… “This is a remarkably fine work played with great empathy and understanding”.